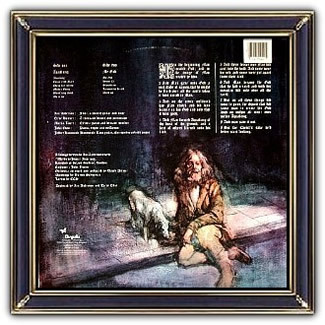 The original cover art by Burton Silverman features a watercolour portrait of a long haired, bearded man in shabby clothes with a malevolent stare. He was pictured against a doorway almost cornered but still menacing (this seemed to be much of the content in a couple of the songs in the album). The skiing poster was used as a mildly ironic contrast to this fringe person who would usually be ignored in the street. Anderson was not a model for him, but the hair and the outlier look was a reference to his performance persona. The back cover figured the other side of this creature’s rant at the world, the hopeless side as he sat alone in he dark and with only a stray dog, as a companion. The inside is a painting of the band playing in a Chapel with frontman Anderson in his antic stage dance. It was taken from a photo as were the others in a madcap concert inside the chapel. 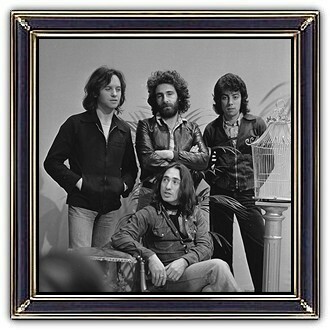 Silverman claims the art was only licensed for use as an album cover, and not for merchandising; and approached the band seeking remuneration for its further use. The original artwork for both the front and back covers are now privately owned by an unknown family, apparently having been stolen from a London hotel room. 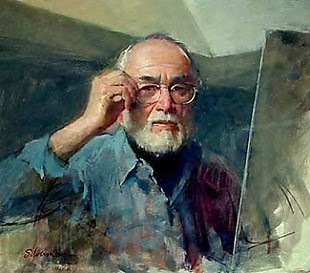 Burton Silverman (1928, Brooklyn) has been exhibiting his paintings for over 60 years. He has had solo shows worldwide , including cities such as New York , Boston, Philadelphia, or Washington. 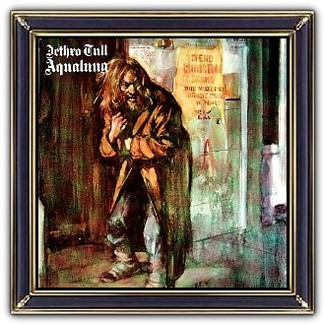 He has won 37 major prizes in the world but for many people mr. Silverman is recognized as the artist of one of the most famous record covers in the history of Rock: Jethro Tull´s Aqualung. Ian Anderson always said that he never liked it, really. What about this? 'Well Anderson certainly has that right, but the album comes to life with that painting of mine. I was told that years later kids on Long Island in New York made their Halloween costumes based on that painting. Jethro Tull were a British rock group, formed in Luton, Bedfordshire, in 1967. Initially playing blues rock, they developed their sound to incorporate elements of British folk music and hard rock to forge a progressive rock signature. The band was led by vocalist/flautist/guitarist Ian Anderson. Their first commercial success was the folk-tinged blues album Stand Up (1969), which reached No. 1 in the UK charts. Their musical style shifted in the direction of progressive rock with the albums Aqualung, Thick as a Brick and A Passion Play, and shifted again to hard rock mixed with folk rock with Songs from the Wood and Heavy Horses. The last works released as a group were in 2003, though the band continued to tour until 2011. In April 2014, as he was concentrating on his solo career, Anderson said that Jethro Tull were finished. Jethro Tull have sold over 60 million albums worldwide.